(Oregon Coast) – Whether or not the weather will hold up around Oregon and the Oregon coast is still unknown.  But either way, a monumentis moment in the sky is coming on October 23 with a solar eclipse. 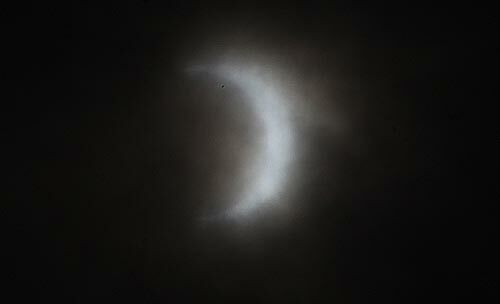 (Above: a solar eclipse in 2012, seen from Oregon). Only 15 days after the Sun, Moon and Earth aligned to create that awesome lunar eclipse, now it's the Sun's turn to get a chunk bitten out of it. Jim Todd, planetarium manager at Portland's OMSI said the Moon will cast its shadow onto most of North America and the eastern tip of Siberia. The center of the Moon's shadow will just miss the Earth, passing above the North Pole. Here, in the U.S. and Canada, the partial eclipse will be seen a few hours before sunset. In eastern Russia it will show up at sunrise. In Portland, around Oregon and at the Oregon coast, it will begin a bit after 1 p.m. The Moon makes its first contact with the Sun at 1:37 p.m., Todd said. To view this is a tricky and dangerous thing, but OMSI and Rose City Astronomers are willing to help via a viewing party at the south parking lot of OMSI on Thursday, October 23. The free event will begin at 1:30 pm and end at 4:30 pm. 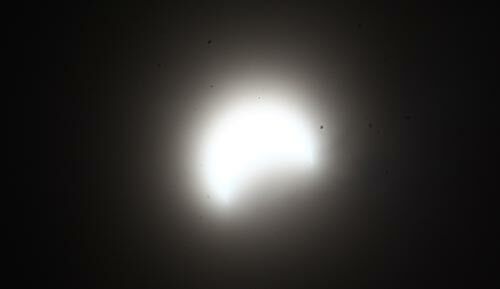 Filtered solar telescopes will be available for safe viewing of the Sun. Filtered solar telescopes will be available for safely viewing the Sun. On the scheduled day of the Partial Solar Eclipse Viewing, it is suggested that interested visitors call the OMSI Star Parties Hotline, (503) 797-4000 #3 then #5, or check the OMSI Star Parties web site http://www.omsi.edu/starparties for possible weather-related cancellations. Todd had some urgent words of caution. Watching it through binoculars or a telescope is also very dangerous and Todd said you will need an approved solar filter. Special solar filter viewing glasses are available at the OMSI Science Store (503-797-4626). Todd said a good, safe way to see it is by projecting the Sun's image onto a surface by making a simple pinhole camera. First, you need two pieces of stiff white cardboard and a piece of aluminum foil. 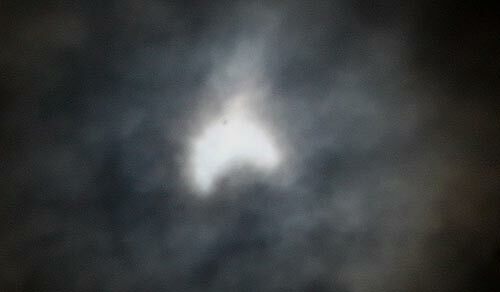 The last such eclipse seen in Oregon was in May of 2012. After the October 23 eclipse, observers will have the good fortune to enjoy an even more spectacular eclipse; a total eclipse visible from most of Oregon, on August 21, 2017. The next annular eclipse for the U.S. won't come until October 14, 2023.